Thompson’s Warbler, originally uploaded by dmzajac2004-. Copyright © Deborah M Zajac. All Rights Reserved. A sure sign of Spring is when the Allen’s Hummingbirds return to the Santa Cruz area. A couple of friends and I went over to the Arboretum to check to see if they’d returned and a few had. 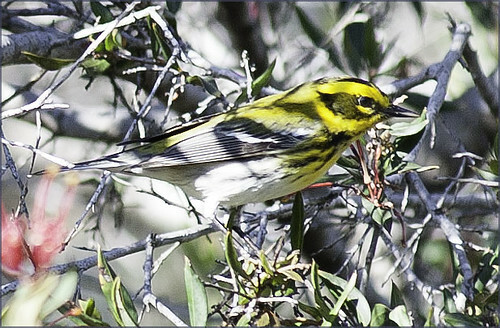 While photographing them we spotted this Townsend’s Warbler. It’s the first time I’ve photographed one. Previous Previous post: Hybrid-Crested Pekin Mallard?